HYDERABAD: As International Water Day approaches, state government authorities rather than just conducting ‘awareness campaigns’ can take a step in the direction of bioremediation, a technique of using plants for decontaminating polluted environment. The importance of this lies in the fact that half of the sewage water that is generated in Telangana ends up in rivers and lakes without getting treated and bioremediation is a cost effective way to treat waste water. Various studies have been conducted over the years which have shown that plants have the ability to purify waste water. Dr MVSS Giridhar of Centre for Water Resources at JNTU-Hyderabad says, “There are certain plant species which are efficient in absorbing nitrates and phosphates present in sewage water. Sewage treatment plants are not capable of removing nitrates and phosphates, that later enter water bodies, resulting in worsening of water parameters like Biochemical Oxygen Demand and Dissolved Oxygen. While human waste is a main reason behind presence of nitrates in urban sewage, usage of detergents and soaps are reason behind presence of phosphates. A study conducted by JNTU-Hyderbad researchers to test efficacy of two plant species, Canna indica and Colacasia esculenta on treatment of sewage water found that the plants could reduce nitrates, phosphates, total suspended solids, BOD and other contaminants in the sewage water by 50-70 per cent. Not just nitrates and phosphates but studies in India and abroad have shown that some plants, known as ‘hyperaccumulators’ have the capability to absorb unusually large amounts of heavy metals like lead, arsenic, mercury and cadmium from contaminated water, in comparison to other plants. Heavy metals are also not removed by the conventional sewage treatment plants. The usage of bioremediation is done through constructing ‘artificial wetlands’. Wetlands are known as Earth’s kidneys as they are capable of naturally filtering water. As water flows slowly through a wetland, solid wastes get trapped in foliage. 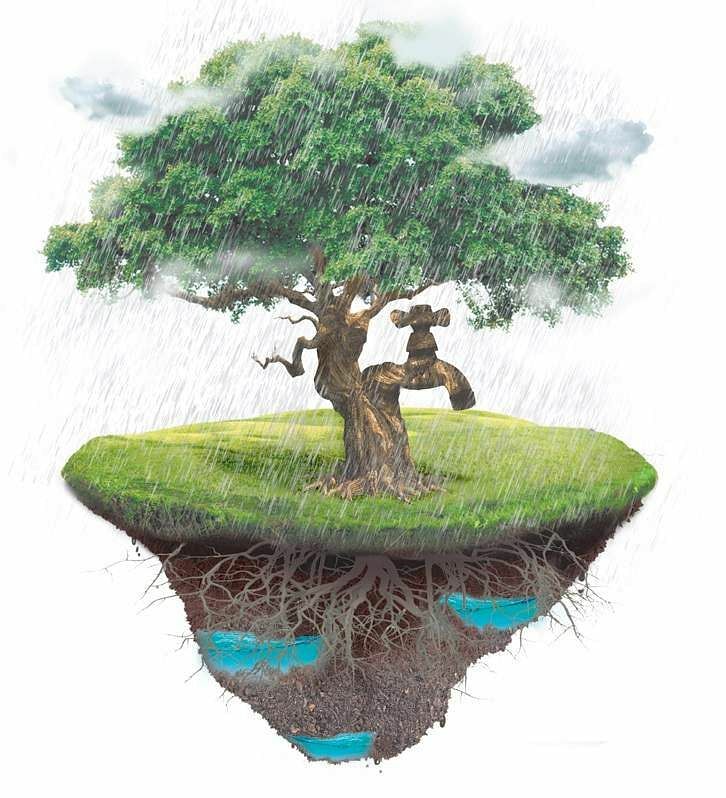 The dissolved organic and inorganic pollutants get broken down by the roots and upper portion of plants. Micro organisms that exist in the wetland ecosystem also help in breaking down of pollutants. A constructed wetland simulates the natural wetland. Specific wetland plant species like poplar trees, willow trees, alfalfa and reed can be grown for making the wetland effective in treating waste water. For their study, the JNTU researchers also created an artificial wetland for studying effect of the two plants on sewage water. Such artificial wetlands can be constructed along the open drains that flow in city carrying sewage water, along the path of Musi river as suggested by National Geophysical Research Institute many years ago and also in gated communities and buildings, like the one in CII-Godrej Green Business Centre in Hyderabad. “Construction of wetlands and using plants for remediation of sewage water is a method will require low cost and researches have proven they are effective. The government should now work on finding out how this can be implemented on a large scale,” Dr Giridhar says.